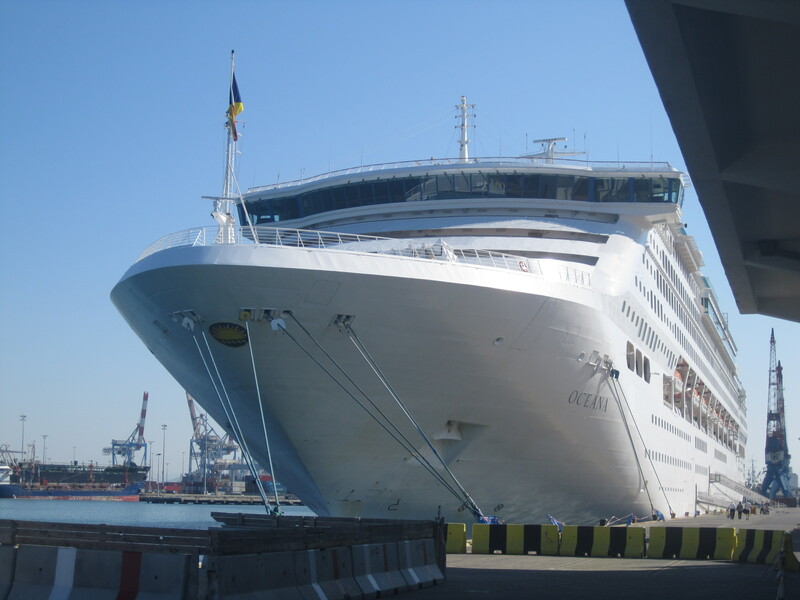 Well, as most of you know, I boarded Oceana yesterday in Southampton for an 11-night Atlantic Coast voyage. At present we are somewhere off the coast of France sailing through the Bay of Biscay and she is living up to her name. So far all is as expected, wonderful. I am quite content being back onboard and have bumped into a few familiar faces which is always nice. The ship is as I left her in February but with a new touch here and there. There is new seating at the Horizon Grill which I really like. Far better than what was there originally and it actually makes the deck look far more attractive. As an added bonus the seats are also very comfortable. The crew so far have been wonderful, as always they can’t do enough for you. I still stand by my belief that P&O Cruises have the best crew members BY FAR! Nothing is ever too much and having dietary needs, I often have to ask for things to be altered slightly or substitutes made. I have soya milk for breakfast and in my cup of tea and I never have to wait long for it. In fact I asked for some earlier as I was on deck 14 and didn’t fancy running back to my cabin for some as my tea would have been cold by the time I got there. The restaurant manager asked me to take a seat and not only brought me my soya milk, but he also brought me a fresh brew, just to make sure it was still hot. Its little things like this that make the biggest difference. Today I am walking around taking pictures and generally just seeing what’s going on in different areas. I have also scouted out Café Jardin, one of my favourite haunts and I am planning on dining there tomorrow evening. The cover charge is only £5.25 per person and the food is superb! EVERYONE should try it! The restaurant manager already recognised me and assured me he would once again speak to the fishmonger regarding extra prawns 😉 comes to something when you have a reputation onboard for scoffing all the prawns! I can’t help it though, they are SO good and the rosemary bread is incredibly tasty! 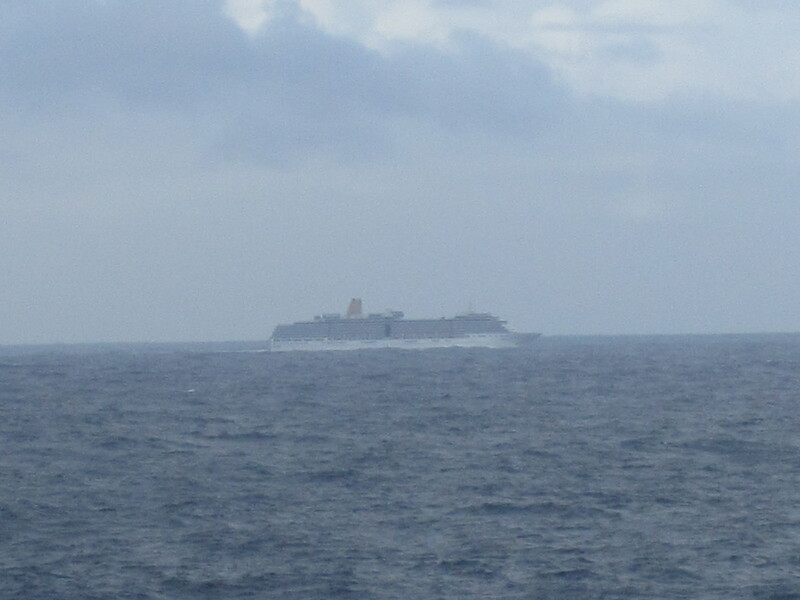 As I was wandering around outside, braving the cold and wind, I had the pleasure of seeing Arcadia pass us, one of Oceana’s fleet sisters. She looked like she was handling the sea conditions very well and although the cloud was starting to roll in I managed to get a recognisable photograph of her. Our first scheduled port is La Coruna, we are expected there tomorrow. I suppose time will tell if we can actually get in or not. The port was cancelled on my cruise in June so fingers crossed this time we will be lucky! I will check-in with you all again soon, hopefully with pictures and info on some delicious food. Let’s face it we all love a good food blog and according to one of the fitness instructors onboard the average passenger gains between 7 and 14lbs per voyage, which I can quite believe! Until then I will continue to enjoy the rough sea conditions and avoid passengers who are looking a little green. I am sitting on deck 7 at the moment outside the Yacht and Compass, even here being mid-ships and on a relatively low deck you can feel every movement. My wife and I are on the Oceana at the end of July 2014. Looking forward to it. This will be our 4th cruise with P&O so no complaints from me about service. Spot on. Is wifi available on board then, we are doing the world cruise on arcadia next year and cannot find any information on this? 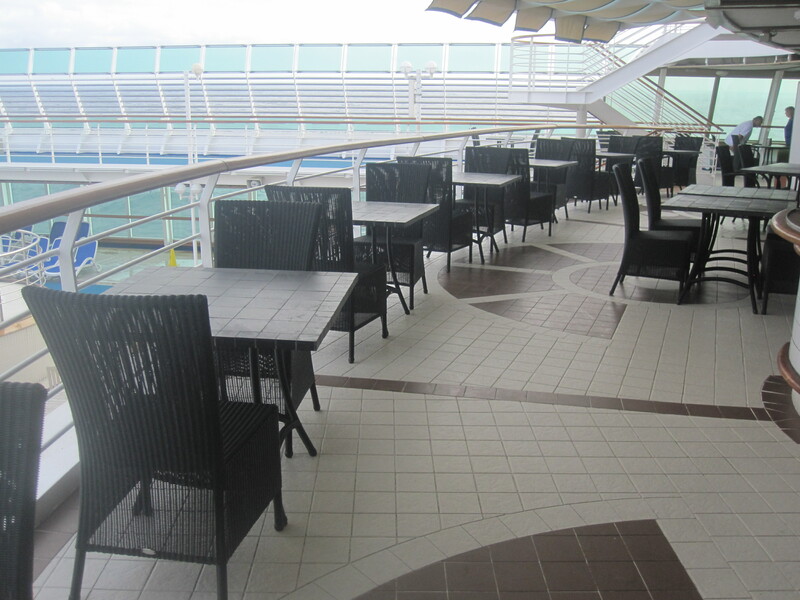 Would you say P&O are a go to line for people with dietary needs? they seem to be really helping you which is very reasuring. Nice to read your report , in the midlands we have a very sunny day but a little cool wind. Enjoy your meal in Jardin tomorrow. Look forward to your reports.